Following the introduction of Bachelor degrees (2005) and Master degrees (2008), which replaced the traditional Diploma degrees in Germany, the employability of those leaving University with a Bachelor degree was quite unclear and almost confusing. 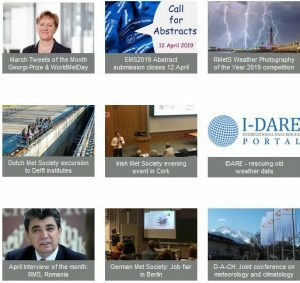 In order to help both students and potential employers in the wider area of meteorology, the Berlin & Brandenburg section of the German Meteorological Society (DMG-BB) initiated and organised the first “Jobbörse” – a job fair – in 2010. This event was very successful, and was appreciated by students and the companies and institutions involved. Since then, the job fair has taken place every three years at the Institute for Meteorology at the FU Berlin. Although the confusion surrounding degrees has gone, the students are still interested in employment options and the job fair now focuses on Bachelor and Master graduates. 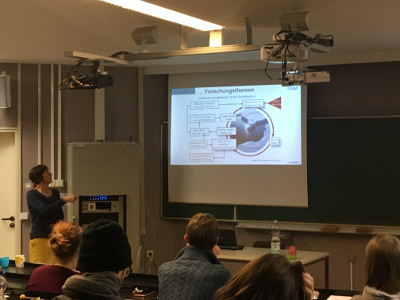 On 28 January this year the 4th job fair, hosted by the Institute for Meteorology at the Freie Universität Berlin as usual, was organised in cooperation with the youth section of the DMG (jDMG). Representatives of weather services (public and private), a research centre, and small companies from the wind energy and software development sectors provided short overviews on the activities of their respective institution or company and illustrated employment options for both Bachelor and Master graduates. Following the presentations, the second part of the event was organised as a fair: the institutions and companies each had a booth where representatives were available for questions and intensive one-to-one talks with the students.